Tofu is a great substitute for meat, fish and seafood and can really deliver when used in many traditional recipes. It’s an excellent source of amino acids, iron and calcium and is one of the richest vegetarian sources of protein. Mexi-can be healthy and vegetarian! Combine tomato and onion in a small bowl. Season with salt and pepper and mix well, then set aside. Heat 1 tbsp olive oil in large pan over medium heat. Crumble tofu into pan and cook for 2–3 mins or until slightly brown. Season tofu with paprika, cumin, fresh chilli, salt and pepper, then add black beans and stir to combine. Cook for another 3–5 mins or until golden brown, then remove from heat. In blender, add all dressing ingredients and blend until smooth. 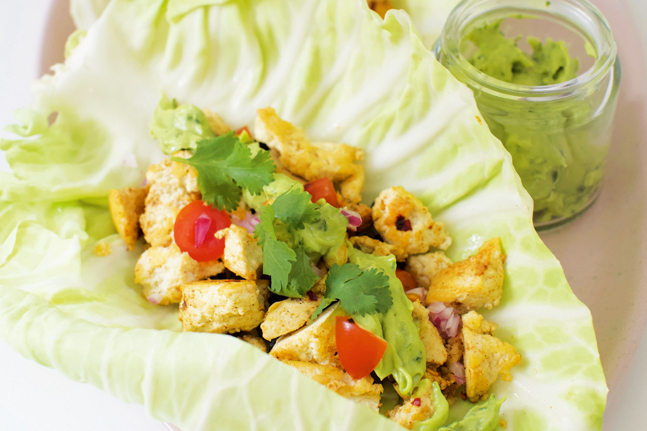 Divide tofu and bean mix onto each lettuce cup. Top with tomato and onion salsa and red cabbage, then drizzle with lime-avocado dressing.